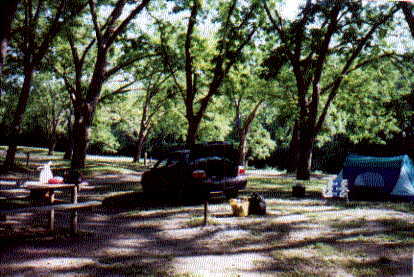 This was one of the rare campgrounds that I found on the internet during my pre-trip planning. Usually I just drive until I find something that looks good. But it was their "Leisure Camp" web site that convinced me that it was worth going out of my way to spend the night there. It sounded really good, and the ad said it was, "Serene and peaceful". 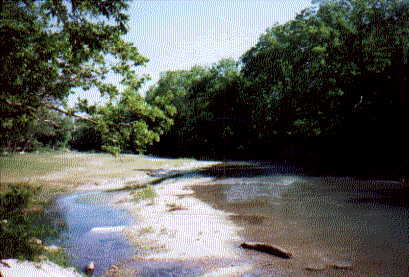 I arrived there in the late afternoon and chose a nice, spacious site benieth a large shade tree down by the river. After setting up my tent, I soaked my feet in the cool waters of the San Marcos River and enjoyed the scenery. Later, needing some spring water, I left my campsite and drove down the street to the little store to buy a gallon. When I left the campground and entered the road, I noticed 2 young men get into their pick-up truck. It's a small rural road. They pulled up, right close, behind me, blowing the horn, revving their engine, spinning their wheels. There was plenty of room for them to go around me if they wanted to. I just kept driving the speed limit, and tried to ignore them. I figured they are just having fun trying to shake me up a little. It was working. They stayed behind me all the way to the store. When I pulled in, the truck also pulled in. One of them got out of the truck, climbed up on the back bumper of the truck, and started jumping up and down making loud whooping noises. Boy, these guys are good! I went into the store nonchalantly (the perfect word--casually indifferent, cool, unconcerned!) Yeah, right. Inside I was anything but nonchalant. Bought the water, headed back to the campsite. I guess you just have to expect some "uncomfortable" experiences no matter where you travel. You just have to decide whether or not its something to worry about. Things like that can happen anywhere--it's no reflection on the campground. Plus, it had been a long, hot, tiring day. I figured my nerves were probably just a little more "frazzled" than usual. Anyway, I said to myself, "What's the big deal? Get over it! Just open up another can of tuna fish and try to relax." That night I sat quietly at the picnic table in the dark and watched the fireflies before crawling into my tent. Fell asleep listening to the comforting chorus of crickets. Later that night I heard something thumping against the wall of my tent. Turned on the flashlight to see what the noise was--it was a big frog trying to get out of my tent! So I picked him up and gently placed him outside my tent door. Bye little froggy! Feeling a tinge of homesickness and also feeling the need for a little human contact and conversation, I noticed a young couple sitting under the awning of their RV. I ventured to approach them to say, "Hello!" They were very friendly. We talked about traveling for awhile and then they invited me to share supper with them by the campfire. Ahhhhh, just what I needed--a little companionship and conversation to sooth my soul for awhile. In response to comments made in my "Guest Book" (by a woman who works there at the campground) concerning my experiences while staying at Leisure Camp, I've thought it over, and I realize that she is correct. I was too harsh & unfair when I wrote about my visit at Leisure Camp. So I am re-writing some of this page to reflect my change of heart. Leisure Camp does have a lot of excellent points. It is very clean and quiet. And the people that I met there within the campground itself were friendly and made me feel comfortable.